understand that there was still a purpose for him. with a strange man that is not accepted by her family. http://www.fmam.biz/reviews/speakman/sep06.shtml "Tryggvarin is one of those characters that bring a melancholy longing to your heart. He's spellbinding. L. Shannon's writing of this character is nothing short of brilliant. " Thanks Christine! 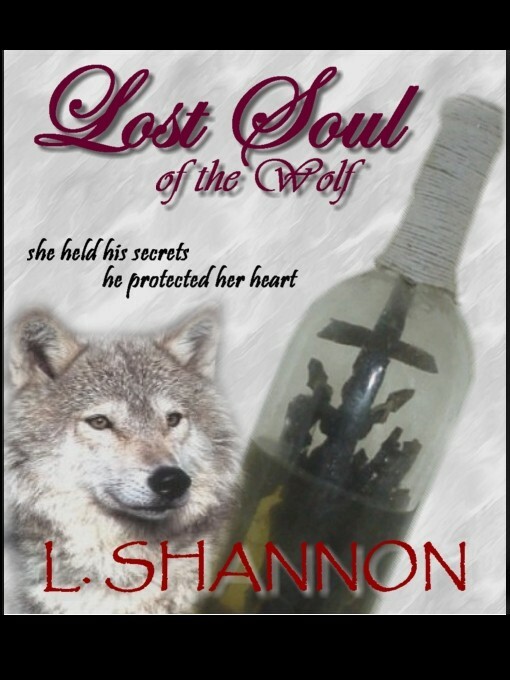 http://www.coffeetimeromance.com/BookReviews/Lostsoulofthewolf.html "L. Shannon has written a heart tugging tale of the power of friendship. Alice offers her unflinching faith in Tryggvarin, despite his true nature, while he offers her a soft place to fall when life turns hard. I was immediately drawn into the story and thought it sweet. The sadness displayed by Tryggvarin will touch the heart of many a reader. The touching conclusion left me wanting more." Thank you Kathy! 4 cups! The wolf crouched silently just outside the light from the campfire, watching, waiting for the right moment. He barely contained his growl when he saw that they had the girl bound hand and foot on the other side of the fire. Her two captors were eating mutton unaware of the cold eyes that followed and judged their every move. So far, they ignored the girl. They had not offered her comfort or even part of their meal. She whimpered when one of the men stalked around the fire. He leaned over her, his hand sliding up her shivering leg, dragging her tangled skirt up as well. She struggled to pull back, but was without escape. The wolf’s earlier growl rumbled into the air, stilling all motion within the camp. His growl stopped the man’s action and froze his hand. The scent of his fear and sound of his guilty heart thrummed through the wolf awakening his long dormant instincts. The second man reached for his bag of weapons, but before he could fully turn to face the threat, the wolf surged out of the darkness. He bit into one hand with a satisfying crunch, and then dodged a poorly swung knife. Slashing fangs tore into the man’s thigh and copper blood filled his senses. Then he was forced to leap back to avoid a second swing, this one slightly stronger. He lunged upward, taking a shallow cut to the flank, and crushing the man’s shoulder in his fierce bite. The weapon fell to the ground, followed by the wailing would-be villain. A muffled cry drew his attention to the second man, who was dragging the girl away from the camp. In three bounding leaps, he caught them, biting the man’s calf and throwing him off balance. The girl landed with a thud as the man scrambled away from his snapping jaws, but there would be no escape. He harried the man with small tearing bites as he crawled away from the girl. Although, he restrained himself from inflicting any mortal wound, he did mark the man well enough for his people to easily recognized him for his crimes.